The planning sub-committee will meet to discuss and decide on the application to demolish the Dalston Theatre/Four Aces and adjoining buildings, next Monday, 6 February at 6.30pm. Any member of the public can attend and we are urging that as many people as possible should go along. Hackney Council's Planning Department have recommended that the buildings be demolished, although the Committee are not obliged to follow their recommendation. We have registered for a representative from OPEN to speak at the meeting. The meeting takes place in the Council Chamber on the first floor of Hackney Town Hall. Please note that you are advised to contact the Committee Officer Ryan Ocampo on 020 8356 3338, if you might require special assistance to reach the first floor Council Chamber. If you still want to email your objections to the proposed demolition of Dalston Theatre, you can do so until 5pm today, 30 January. Today is also the deadline for written objections to the Transport for London planning application No: 2005/2840 for the Dalston Junction site. As advised previously, members of the public can attend this meeting at Hackney Town Hall, when there will be two questions on the agenda about Dalston. The question about Broadway Market and other Dalston property sell offs has now been moved up the agenda and Hackney Council have organised an extra room to accommodate the high number of members of the public who are planning to attend. 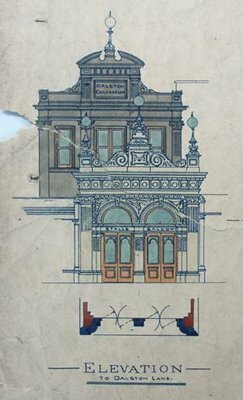 OPEN is grateful to Lady Jill Low who has unearthed this 1898 architect's drawing of the proposed entrance to Dalston Theatre of Varieties, at 14 Dalston Lane, which was built forward from the original 1886 circus entrance.